DJ Mag have posted their Tech Awards 2006, and while it’s not exactly bursting with surprises – They’re liking the Allen & Heath Xone:3D, Ableton Live is a good thing, Sennheiser ‘phones are great… – it’s great to see CDM favorites Resolume and the BCD2000 getting some recognition. Eclectic Method: For this category, Resolume is the most versatile and interesting piece of software. Eserin: For £130 you get an expandable set-up, loads of effects to keep interest going and easily assignable clip banks, plus DMX control for lighting shows. VJ Anyone: It also memorises setting, works in high definition (HD) and VJs can control clip speed by music beats. Halliwell: There’s a vast differrence in the price and I think VJs will get bored quickly with the other software. WestEnd DJ: Even after buying a controller it’s still better value for money than the rest and it’s a lot more versatile and well designed. Slightly more interesting is the choice of the BCD2000 as Best Midi Controller. I definitely agree that it’s a great device, but its quirky non-customizable midi assignments, jog-wheel difficulties and complete lack of Mac support preclude this from best midi anything for me. It’s a great device, it could be brilliant, but Behringer need to put in the work first to finish it off. 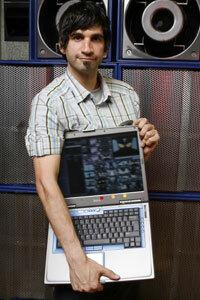 The Midi controller with the most was the Behringer BCD2000 with its built-in soundcard and DJ-friendly layout. Eserin: I’m with this one because it’s got a soundcard built-in, it’s dirt cheap and it’s the most accomplished DJ interface out of the lot. It works with any software including Traktor and Ableton. All you need to do is plug some speakers in the back, headphones in the front, map your controls and that’s it. WestEnd DJ: We’ve got to think about the majority here and the fact that it will work with Ableton is great. Halliwell: I think most DJmag readers are going to be into the Behringer because it’s the only controller that properly mimics a DJ interface and it’s so cheap. It’s definitely cheap. The Ableton point is moot though, as any midi controller will work with Ableton, although I’d say the BCD’s annoying midi implementation and lack of class-compliant driver means that it works less with Ableton than a most other midi controllers. There is some light at the end of the tunnel though, as Bome’s Midi Translator Pro public beta has finally been released, so I can finally talk about it! Watch out for the review and BCD templates for Resolume, After Effects and other visualist favorites.